Upon the discovery of major mold development in a Berlin, NJ home or business, owners can easily become overwhelmed. When it comes to researching about mold removal in Berlin, NJ, home and business owners sometimes find themselves in foreign territory with no idea of where to begin. 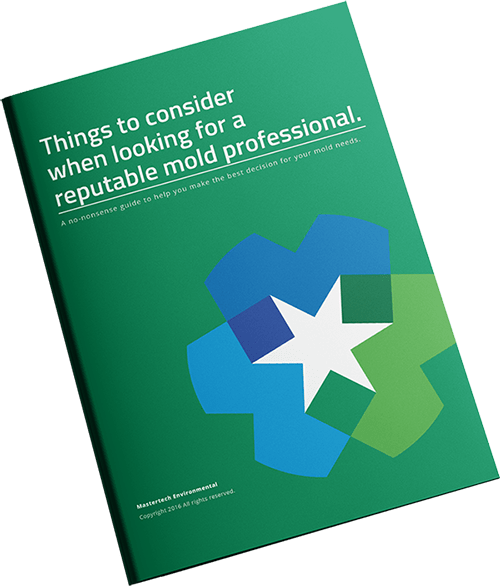 Mold has such an infamous reputation, and finding the right company to handle your mold needs can be a daunting undertaking. At MasterTech Environmental, we understand and can appreciate your concerns and high expectations. After all, when it comes to your home and family, you cannot settle for just satisfactory work. Every member of the MasterTech Team is meticulously trained and certified to properly and thorough resolve all your mold-related problems. If you suspect concerning fungal activity in your Berlin, NJ home or business, you should start by considering a professional comprehensive mold inspection of your property. Through an extensive visual assessment, complete moisture mapping with moisture meters and thermal imaging, and sample testing (if necessary), your MasterTech inspector will be able to diagnose the full extend of the problem and what caused it in the first place. If you suspect a mold growth in your property, you should consider hiring a professional to complete a thorough Berlin, NJ home or business mold inspection. When it comes to mold, reaction time can be the game changer. A professional assessment completed during the early development of mold can help to avoid a costly remediation in the future. Through a visual assessment to identify the immediate concern, moisture mapping and thermal imaging to diagnose the causation, and collecting of samples for scientific analysis, a trained inspector will be able to piece together a relatively clear picture of the full extend of the mold problem and offer a solution. MasterTech has taken care to craft an inspection process that will be the least invasive to your property, as to minimize as much risk of cross contamination as possible to unprotected surrounding areas of your Berlin, NJ home. After completing a mold inspection, your inspector will be able to present you with a report of finding and draft a scope of work for your specific mold needs. Mastertech Environmental provides professional mold testing services in Berlin New Jersey for home and business owners. Determining mold species and levels of airborne mold spores will help us figure out if your health or property is at risk. We’ll take that information and develop a plan of action to properly remove the mold from your home. Our certified, professional Mold Inspectors will identify your mold problems and mold species and develop a scope of work to remove the mold safely. MasterTech has time to develop a mold remediation process that promises the safest, most efficient, and most effective mold remediation from start to finish. Each mold remediation in Berlin, NJ should include: identification and treatment of all areas of concern, a safe, efficient, and effective cleanup, and recommendations for preventative measures that ensure mold and moisture control in the future. Our 12-step process ensures control of the problem through proper containment and protection of your Berlin, NJ property. We take care to complete a thorough cleanup and proper disposal of all contaminated materials. Once the work is complete, we confirm the job was done right with post verification testing. 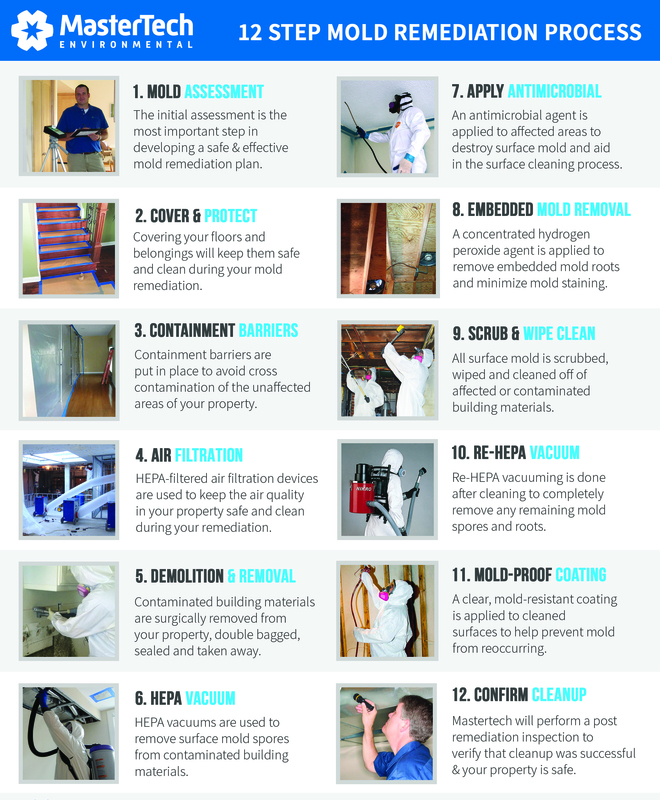 One of the key components of a mold remediation in NJ is prevention. It is absolutely vital that we address the underlying water issues that are promoting mold growth, as well as thoroughly removing existing mold development. If the water source is not found and fixed, the mold will inevitably grow back, despite a proper cleanup. Often times elevated moisture levels can be attributed to leaks, seepage, flooding, or just overall humidity. Taking the time to accurately diagnose the water source and implementing the appropriate preventative measures is the key to avoiding more costly mold remediation and water mitigation further down the line. A proper and thorough scope of work will include all recommendations for preventative tactics that you can implement to avoid future mold growth. To reassure you that your mold remediation was completed properly, MasterTech Environmental offers a 5 year, mold-free warranty with every Camden County, NJ mold removal. Mastertech Environmental is certified to perform mold removal and remediation throughout New Jersey. If you are seeking out a professional, comprehensive mold inspection in Mount Ephraim, NJ or a safe, effective and affordable mold removal in Magnolia, NJ, MasterTech will exceed your expectations.